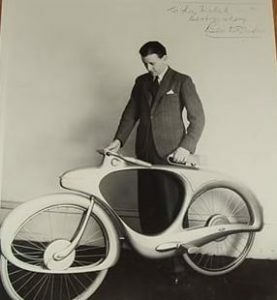 The streamline cycle, shown here in an early press photograph, used a new energy-storing device calculated to revolutionise cycling by storing energy when travelling downhill and releasing it on climbing. It was designed by Ben Bowden, a well-known Leamington industrial designer and consulting engineer, to be displayed at the Britain Can Make It exhibition in London in October 1946. Mr Bowden, who came to the Midlands to work in the car industry in Coventry, had most recently designed the Healey Elliot, a 2.4 L sports car, which was in 1947 the first British car to break the 100 mile an hour barrier. In WW2 he designed an armoured car which was used by King George VI and Winston Churchill. As no British manufacturers came forward, in 1949 Bowden considered having the bike manufactured in South Africa but changes in import policies there prevented that taking place. In the early 1950s, Bowden moved to Michigan in the United States and in 1960 began production in fibreglass instead of aluminium, abandoning the hub dynamo and adapting the assembly, and giving it a new name: The Spacelander , to capitalise on interest in the space race. It was originally produced in five colours, Charcoal Black, Cliffs of Dover White, Meadow Green, Outer Space Blue and Stop Sign Red. 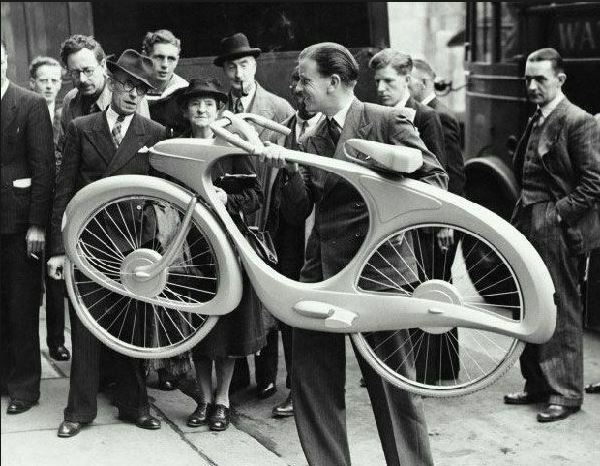 It originally cost $89.50 which made it one of the more expensive bicycles on the market. Although the Spacelander with its dual headlights and rear lights built into the body frame of the bike, was produced for just one year, after a revival of interest in it as a collector’s item in the 1980s, it remains the most sought-after middleweight bicycle ever made. The follow-up Bowden 300 E, which also had a fibreglass body, is even more rare: very few are known to exist. Spacelanders can be bought on eBay for upwards of $800. A set of lights can be acquired for a similar amount. Benjamin George Boden was born on 3 June 1906 in North Kensington. He died aged 91 on 6 March 1998 in Florida. He came to Warwickshire as a car designer and by the 1930s he had become chief body engineer for the Humber car factory at Coventry. In 1945 he left to form his own design studio in Leamington Spa with John Allen. The studio, Allen-Bowden Ltd, at 4 The Parade, was one of the first such design firms formed in Britain, and was known to work in collaboration with other designers, – Achille Sampietro, for example, developed the chassis of the Healey Elliot. In the United States, Ben Bowden worked on the early Chevrolet Corvette and the Ford Thunderbird. His futuristic bicycle was again produced briefly in the late 1980s, when the first reproduction, modified to improve durability, sold for $4000.